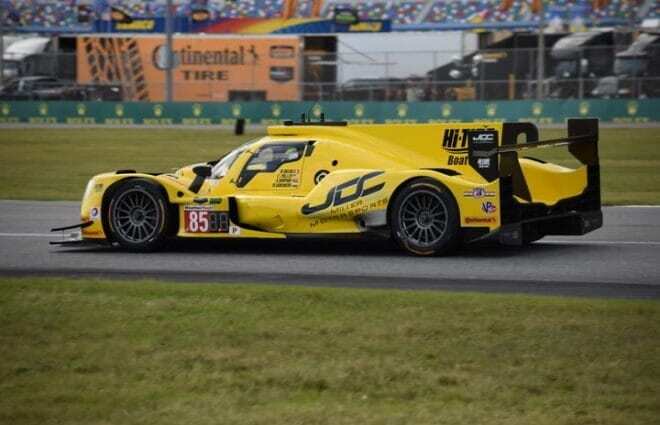 Thursday, the 46 IMSA WeatherTech SportsCar Championship teams took to the 3.74-mile Sebring International Raceway for three practice sessions. The main story heading into the weekend was how the Cadillacs would fare after being hit with multiple rule changes designed to slow them down. The overall result is that they aren’t necessarily going to run roughshod over the field, but they’ll still be tough to beat in this 12-hour endurance race. In the first session, JDC/Miller MotorSports’ Stephen Simpson was fastest overall with a lap of 109.516 seconds (122.941 mph). Despite being turned in during the first session, Simpson’s lap held up to be the best of the day, four-hundredths of a second faster than Action Express Racing’s Christian Fittipaldi. Mike Conway was third in the second Action Express Cadillac, followed by José Gutierrez in the PR1/Mathiasen Motorsports Ligier JS P217-Gibson. Mazda’s Jonathan Bomarito was fifth quickest. Prototype Challenge saw Performance Tech Motorsports’ Patricio O’Ward fastest with a lap of 115.172 seconds (116.903 mph), good for 12th overall. The lap was 2.6 seconds faster than Gustavo Yacaman in BAR1 Motorsports’ No. 26. In GT Le Mans, Porsche GT Team’s Frédéric Makowiecki was quickest with a lap of 117.109 seconds (114.970 mph) in the No. 911 Porsche 911 RSR. The lap was six-hundredths of a second faster than Ford Chip Ganassi Racing’s Scott Dixon in the No. 67 Ford GT. The No. 66 Ford of Joey Hand was right behind in third. Laurens Vanthoor in the No. 912 Porsche was fourth best, while Stefan Mücke was fifth in the No. 68 Ford. GT Daytona saw Paul Miller Racing’s Lamborghini on top of the charts with Bryan Sellers setting a lap of 121.040 seconds (111.236 mph). That lap was just nine-thousandths of a second faster than Stevenson Motorsports’ Audi driven by Lawson Aschenbach. Seven-hundredths back was Connor de Phillippi in the Montaplast by Land-Motorsport No. 29 Audi, followed by Jack Hawksworth in the No. 15 Lexus. However, later on in the session, the No. 15 stopped on course with Robert Alon at the wheel, drawing the day’s sole red flag. Jens Klingmann rounded out the top five in the sole BMW M6 GT3. Session No. 2 saw the Cadillacs rise back to prominence. A quick lap late in the session put Wayne Taylor Racing’s Jordan Taylor on top with a lap of 109.888 seconds (122.525 mph). That lap was two-tenths of a second faster than Action Express Racing’s Joao Barbosa in second. The third Cadillac of Conway remained in third, nearly a half-second back of Taylor to complete a Cadillac 1-2-3. REBELLION Racing’s Neel Jani was fourth quickest in the best LMP2-spec entry, over seven-tenths of a second off Taylor’s pace. Mazda’s Tristan Nunez was fifth. Tequila Patron ESM’s No. 2 Nissan DPi shared by Ryan Dalziel, Pipo Derani and team owner Scott Sharp did not practice in the session. The team spent it working on an issue with their gearbox. In PC, BAR1 Motorsports’ Colin Thompson was fastest with a lap of 114.741 seconds (117.343 mph), good for 11th overall. This lap was just over an eighth of a second faster than O’Ward in the Performance Tech No. 38. Starworks Motorsports’ Garett Grist was another three seconds slower. GT Le Mans remained close at the top. Corvette Racing’s Tommy Milner was fastest with a lap of 117.206 seconds (114.875 mph). 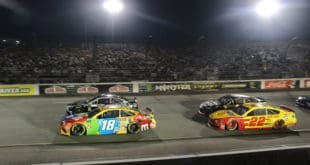 The lap was one-sixth of a second better than Ford Chip Ganassi Racing’s No. 66 driven by last week’s IndyCar Series winner, Sébastien Bourdais. Antonio Garcia in the second Corvette was third fastest, followed by Patrick Pilet in the No. 911 Porsche and Giancarlo Fisichella in the Risi Competizione Ferrari. The top eight cars in the class were separated by a little over 1.1 seconds. In GT Daytona, Stevenson Motorsports’ Andrew Davis was fastest with a lap of 121.449 seconds (110.861 mph), 25th overall. The lap was two-tenths of a second faster than 3GT Racing’s Austin Cindric, who is making the second of three starts in the Lexus RC F GT3 this weekend. Montaplast by Land-Motorsport’s Christopher Mies was third quickest, followed by Park Place Motorsports owner/driver Patrick Lindsey. Alegra Motorsports’ Spencer Pumpelly was fifth. The third practice, held from 7:30 – 9 p.m. ET on Thursday, served as the only on-track time held at night. Sebring can be a tricky place in the dark (although not as tricky as it once was), so getting familiar with those conditions is critical. Despite the transition to nighttime, the Cadillacs still reigned supreme. Conway was fastest in the No. 31 with a lap of 109.815 seconds (122.606 mph) to lead another 1-2-3 for the Cadillac DPi-V.R. Conway’s lap was a quarter of a second faster than Ricky Taylor in second, while Filipe Albuquerque was third fastest. Nunez was fourth quickest in the No. 55 Mazda while Renger van der Zande was the fastest non-DPi driver in fifth in the sole Riley Mk. 30-Gibson. Mazda Motorsports’ No. 70 entry for Marino Franchitti, Tom Long and Joel Miller chose to skip the session. Prototype Challenge saw Yacaman fastest in the No. 26 for BAR1 Motorsports with a lap of 115.205 seconds (116.870 mph). The lap, good enough for 11th overall, was a quarter of a second faster than Sean Rayhall, brought in on Thursday to drive Starworks Motorsports’ No. 8. O’Ward was two seconds back in third. In GT Le Mans, Bourdais was quickest with a lap of 117.116 seconds (114.963 mph), a quarter of a second faster than Vanthoor in the No. 912 Porsche. Olivier Pla was third in the No. 68 Ford, followed by teammate Dixon in the No. 67. Dirk Werner rounded out the top five driving the No. 911 Porsche. Finally, in GT Daytona, Aschenbach was quickest in the No. 57 Audi with a lap of 120.964 seconds (111.306 mph). This lap, the quickest GTD lap of the weekend to this point, was two-tenths of a second faster than Hawksworth in the No. 15 Lexus. De Phillippi was third fastest in the No. 29 Audi, followed by Tristan Vautier in the SunEnergy1 Racing Mercedes-AMG GT3. Sellers was fifth quickest in the No. 48 Lamborghini. While there were no red flags during the session, there were a couple of spins. Grist had an off-course excursion early on after locking up the brakes on his No. 8 PC entry. Later on, Bill Auberlen spun out the No. 25 BMW M6 GTLM at turn 10. While Auberlen continued without problems, it capped off a day for BMW Team RLL where the team was not really competitive with the rest of the GTLM class. Qualifying is scheduled for 1 p.m. ET today and can be viewed live at both IMSA.com and FansChoice.tv.